TRIO'S GOT TALENT: The Wolfe Brothers play in Geelong next weekend. The country brothers who won Australia’s heart on a TV talent quest will return to Corio for a “rowdy” gig next weekend. The Wolfe Brothers played at the Gateway Hotel during a “wild“ carpark gig last year. “There were beach balls going through the crowd and people climbing on other people’s shoulder and climbing the marquee poles,” said the band’s Tom Wolfe said. The boys were recently down in Geelong with Lee Kernaghan for the country legend’s most recent tour. The Wolfe Brothers had been “Lee’s band” for several years, Tom explained. “We’ve kind of called it the best apprenticeship you could get,” he said. 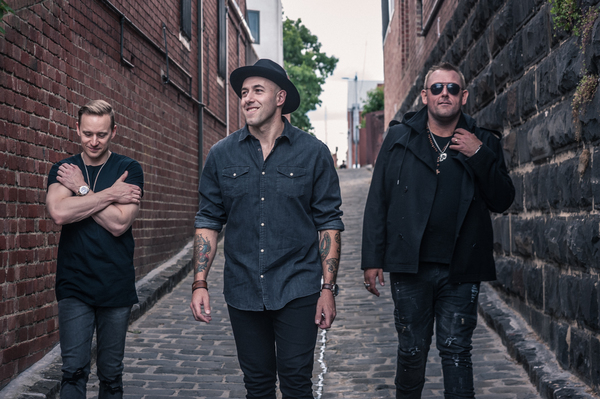 The Wolfe Brothers return to the Gateway Hotel on 4 August on a tour celebrating their fourth album Country Heart, which debuted at 9 on the ARIA charts. Brothers Nick and Tom Wolfe have known bandmates Brodie Rainbird and Casey Kostuik since childhood, Tom said. They had been playing together for a few years at pubs, weddings, and club events before releasing their debut EP in 2010. They found their “niche” at B&S balls and rodeos but still had to work various day jobs in Tasmania to make a living. But their career took off when they scored an audition on Australia’s Got Talent in 2012. “Reality TV is not reality at all,” Tom said. “You’re building a house and all of a sudden you’re flying in a plane, hopping into a limo and driving to a studio in Melbourne. Thankfully, the producers portrayed them as “a bunch of guys who love playing music” rather than over-dramatising their situation, Tom said. The band looked calm in the lead up to their first audition. “But we were s**ting ourselves,” Tom admitted. But unlike some solo acts The Wolfe Brothers had each other to rely on as they progressed through the show’s knockout stages,Tom said. Tom was working as a carpenter before brothers clenched second place in the show’s season finale. “I don’t have to do that anymore which is great,” he said. The result saw the band win fame Australia-wide and tour the US county fair circuit out of Nashville in 2016. “It was incredible mate,” Tom said. “You drive seven hours and end up in Indiana or the middle of Pennsylvania. “You’d come to this little corn town with nobody there … but there would be 10,000 people in a field ready for you to play. After years performing with Kernaghan the Wolfe Brothers live by his creed. “He said, ‘you’re only as good as your last gig’,” Tom said.